Too many children today believe their food comes from grocery stores. But not the students at Molalla River Academy. From kindergarten through eighth grade, the students at this charter school are learning the process of seeds to table as well as the responsibility of ensuring the food's growth. The garden, called Roots of Responsibility is in its seventh year. The year round garden is cared for over the summer by school families offering parents a social outlet with the benefit of taking home all the fresh produce that's ripe, says Iva Quinlan, media specialist and garden coordinator for the school. "Roots of Responsibility opens a new world for the students and shows them how our food is grown," Quinlan said. "They learn its hard work, but their work brings out so many foods. And they taste them all so they grow something and know how it tastes. Since they grew it, it becomes theirs and they get different benefits from the garden. I even made kale chips, which they liked and ate, amazing their parents." Its history is what makes it strong. Before anyone imagined the garden, the school had a greenhouse that was removed about 10 years ago because the school couldn't afford it. A couple of years later, Quinlan took it upon herself to write a grant to Clackamas County's HEAL (Healthy Eating Active Living) grant. It provided the school $8,000. Quinlan and Beth Brighton, working with Shelly Urben, the school's executive director, chose to start small with third and fourth graders meeting every Thursday. The students came up with the name. It stands for learning responsibility and leadership from the roots up. The first community gesture came from Home Depot. It provided the school with materials at cost and sent a work party to work with the teachers and parents to build six raised beds. Gingerich Farms also helped out providing mulch in the form of hazelnut shells and blueberry plants. "Over the next two years, the students filled the beds with lettuce, lots of kale, Brussels sprouts, kohlrabi, garlic and marigolds to deter insect pests and deer," said Quinlan. While education often gets shorted financially, Quinlan says charter schools get even less, so she took on the task of writing more grants. "I wrote about five or six more grants and each one expanded the program," Quinlan said. "We built more raised beds including two large plots we call the three sisters. These gardens are tied to our curriculum and grow beans, squash, corn and gourds that are tied to Native American learning." The children develop compost mixed with cow manure, Quinlan says. Kindergarteners through sixth graders generally keep the garden growing. The middle schoolers are learning to take the plants and cook with them. Part of the newer grants also provided three new raised beds that grow decorative flowers and strawberries as well as herbs such as rosemary, basil, sage and cilantro. Some of the students used the flowers on the Fourth of July to make a flag. Another addition was the tunnel trellis, which is 12 feet long and where cucumbers, two different kinds of squash, and kiwis are grown. Last year, the school added food preservation as an elective for the seventh and eighth graders. "They were so excited about cooking with the food they grew," Quinlan said. "They made 20 pumpkin pies and also pumpkin bread. I taught them how to make refrigerator pickles from the cucumbers they grew. We also made jam from the raspberries, strawberries and rhubarb." The garden isn't just for growing. The school ties other lessons to it. 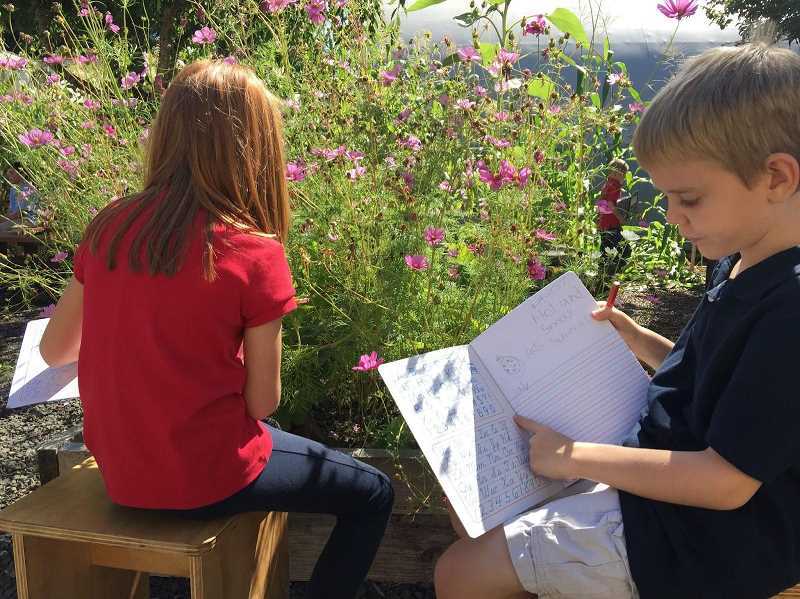 Kindergartener through sixth graders get 30 minutes of garden time a week. Some of their studies are worked into the garden. For example, during a geology lesson the students learn about rocks and soil. They learn what is in healthy soil and do soil testing, Quinlan said. Garden benefactors include Victory Seed Company, Jamba Juice, Seeds of Change, Whole Foods and Gray Thompson Community grant.